17 Manette Street, Soho | Have a look! My favourite rock/metal bar. Music streams just from an old fashioned juke box. No frills and unpretentious but with a lot of character and a friendly crowd. Stays open until the early hours so great for nightcaps! 2-3 Greenland Place, Camden | Have a look! Authentic rock pub offering live music, great selection of beers and ‘dark’ atmosphere. 33 Kentish Town Road, Camden | Have a look! 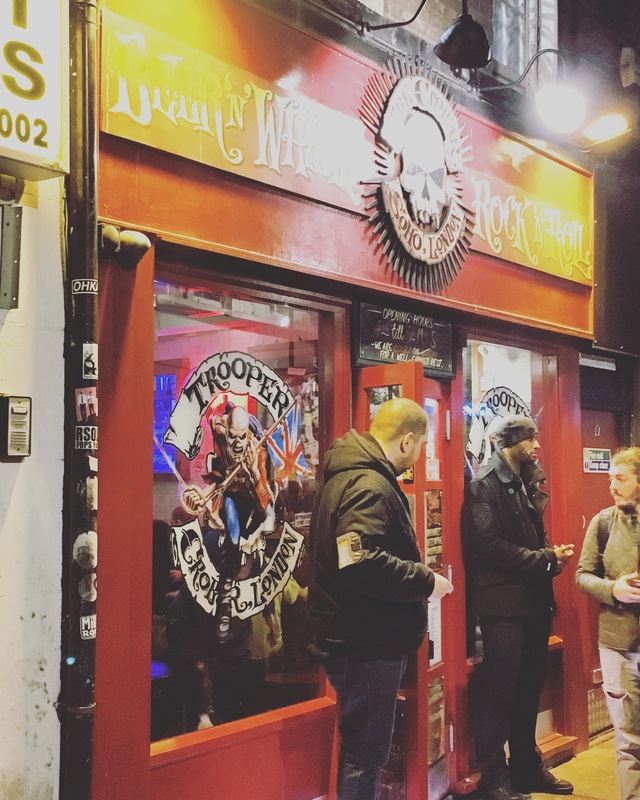 Metal, punk and rock pub also offering live music. 1 Maryland Point, Stratford | Have a look! Iron Maiden’s birthplace. A ‘pilgrimage’ for any Maiden fan. Say no more! 385 Holloway Rd| Have a look! Orange yard, Manette Street, Soho | Have a look! Live music venue with a history of more than 20 years still going strong. Perfect intimate venue to catch up with new rock and indie bands. 148b Old Park Lane, Mayfair | Have a look! A small bar, adjacent to Hard Rock (and part of the chain), with a lot of character and a far more authentic rock vibe than its parent venue. Definitely worth a visit. 150 Old Park Lane, Mayfair | Have a look! The ‘commercial’ option. Still a good one if you find yourself in Mayfair, not your usual rock n’ roll area! The memorabilia is great and the food quite good. 159 Wardour Street, Soho | Have a look! A very historical rock venue founded in 1960, St Moritz became a regular hangout for a lot of punk and rock musicians during the 70s and 80s. 1A Camden High Street, Camden | Have a look! An atmospheric and very special venue. Angel Central | Have a look! I know, this is not an independent rock venue, but it is one of my favourites for live music. The intimate setting reminds me a lot of the Sunset Strip rock clubs. Would really recommend catching a gig here. 174 Camden High Street, Camden | Have a look!